Okay, so there’s this evil space empire, right? And it’s trying to… Aw, c’mon, it’s Star Wars, for cryin’ out loud! Is there anyone out there who honestly doesn’t know what it’s about? Seriously, though: as familiar as the setting may be, the true test of a licensed game is how well it emulates the feel of that setting. Well, this game nails the Star Wars mood very well in both the rules and the writing. This is Good vs. Evil swashbuckling space opera at its finest – those of you looking for angst and grit had best keep looking. I should mention that the basic game primarily supports the time periods of the Empire and of the New Republic, although the timeline chapter includes a discussion of the Old Republic for you fans of The Phantom Menace out there. 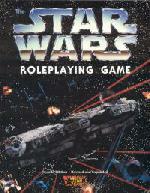 Star Wars, like the D6 system games it spawned and like Atlas Games’ Over the Edge, uses pools of six-sided dice added together to resolve every action. The scale is a bit coarse, running from 2D to 4D for humans, although the “pips” of +1 and +2 between the whole dice do help some. (i.e., the scale runs from 2D to 2D+1 to 2D+2 to 3D, etc.) Almost all skills are rated as dice that add directly to their related attributes, the exception being Advanced and Force skills, both of which are rolled independently of attributes. Every roll of the dice includes a “wild die” which open-ends on sixes and can cause varying degrees of misfortune at the GM’s discretion on a one. Now, I’ll be honest here: I’m not a big fan of dice pools, especially dice pools that are added together – I’m terribly slow at arithmetic. Granted, adding a few six-siders together isn’t higher math by any means, but the pause while I’m adding and applying the numbers tends to slow things down just enough to get annoying. I didn’t really have that problem with this game, though, largely because the effects of exceptional successes or failures are left up to the GM in most cases. Moreover, the rulebook continually drives home one Golden Rule: when in doubt, simply assign a target number and go with it. – Because Beast Riding falls under Mechanical, a naturally skilled beast rider from a primitive planet would also have a knack for Astrogation and Starship Piloting. – The only “Advanced” skill in the rulebook is Medicine; therefore, it’s far easier to repair an Imperial Star Destroyer than a human body. Combat is very quick, as befits the setting. Every mode of attack has its own difficulty number; this number is replaced by a defender’s standard defense or increased by an active defense (with no other actions). On a hit, the difference between the attacker’s damage roll and the defender’s Strength roll (plus any applicable armor) is read against a wound scale. Warning: it hurts to get hit. It hurts a lot. An average hit by a typical blaster, for example, stands a very good chance of incapacitating an average human with one shot. Strangely, though, using a blaster set to stun is much more effective unless you really need (or want) your opponent dead – a hit that would wound on the lethal setting will render the target unconscious on stun. I found the initiative system to be a bit silly. As is the case with Torg and the Masterbook games, it’s determined for sides in a conflict, rather than for individuals, based upon the highest Perception on each side. This means that if the quick-drawing Han Solo is facing the quicker-drawing Boba Fett and the slug-like Jabba the Hutt, Boba and Jabba will usually go first. For future games, I think I’ll be going in order of individual Perceptions instead. Character creation is amazingly simple. If templates are used, just apply 7D of dice to the already configured attributes; otherwise, divide 18D among attributes first. There are only a few minor kinks in the process, such as selecting optional skill specializations and Force abilities. And speaking of the Force, that’s one area in which these otherwise slightly uneven rules truly shine. Overall, while the rules have some problems, they’re quite functional and easy to master – a good thing for a game bound to attract non-gamers to the hobby. The game uses a whole slew of images from the movies, mostly to very good effect. The artwork, while not spectacular, is both reasonably attractive and functional without being overused. The “ads” for various products and services scattered throughout the book are a cute touch, although most lack the “authentic” feel of those found in the Shadowrun books. The writing has a friendly, accessible style, with each chapter ostensibly presented as the words of a different individual in the Star Wars universe. While the descriptions of rules aren’t always crystal clear and there are more than a few typos, the text is an easy read. The core rules are conveniently highlighted for quick reference, and while they’re still a bit scattered, the book’s excellent index more than makes up for this. Considering the book’s $30 price tag, the content is thankfully generous and comprehensive. The book includes a good sampling of Force powers, alien races, creatures, weapons, droids, equipment, vehicles, and planets. It also offers 20 templates, about half of them based on the main characters from the movies. The introductory adventure’s not bad, although it offers little in the way of character interaction – not a good feature for an adventure in which the players should be getting to know their characters’ personalities. What’s really important, though, is that the book really does contain everything you need to play – an increasingly rare trait in RPG rulebooks these days. All in all, it’s an attractive, easy-to-read book that’s sure to be a hit with newcomers to the hobby. Good writing, simple rules, generous content, and an incredibly popular and fun setting make this a game custom-made for new roleplayers, and a darn fine one for old hands like myself as well. And don’t let West End Games’ occasional flirtations with the financial Grim Reaper scare you off, either. Even if the company were to vanish today – which seems increasingly unlikely, now that their DC Universe RPG is back on track – there’s already a massive library of support out there, much of it currently on sale direct from WEG. Buy this game you should.